Franktown Rocks is a Free to play Kids MMORPG genere game developed by Brainwave Studios is a Browser MMO Game. In Franktown Rocks players can create their own character and navigate the city of Franktown, interacting with other players there are a variety of available fun features to keep players entertained. The game is aimed towards children ages 8 – 12, and saw the content is very family friendly, colourful and casual to play. Completely free and available to play directly in your Internet browser the game focuses very much on social interaction with other children in a safe, friendly online environment. When starting up players can create their own character using the character manager panel and they have the ability to select from a variety of different animals and deck them out in various clothes and accessories. In the game the controls are simple point and click for movement allowing players to navigate around the various locations from the city map. Players are able to earn money by playing various games and completing quests for the residents of Franktown and use this money to buy new clothing items, musical instruments and house items. One of the biggest features in the game is the ability to listen to music, loading them up in your player and listen to them as you go as well as watching movies in the movie theatre or the music store. 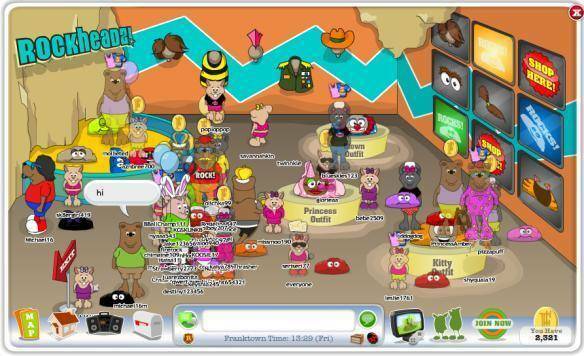 As the game has been designed for children there is a huge safety aspect that takes pride and place within the game to ensure your children can play safely, this includes a zero tolerance on swearing, cheating, cyber bullying or generally mean behaviour to other players as the game tries to foster a cooperative and friendly community. Certain topics are also not permitted such as drug and alcohol related topics as well as any sexual or racial talk that is deemed inappropriate for children and will result in disciplinary action. Parents are able to customise the chat options and choose who their children can talk to and more importantly who can talk to their children. The game is completely free to play, however there are various premium subscription options available from monthly passes, one year passes and even lifetime passes, as well as this players are able to purchase in game currency using real-world money instead of earning it through gameplay at a slower pace.